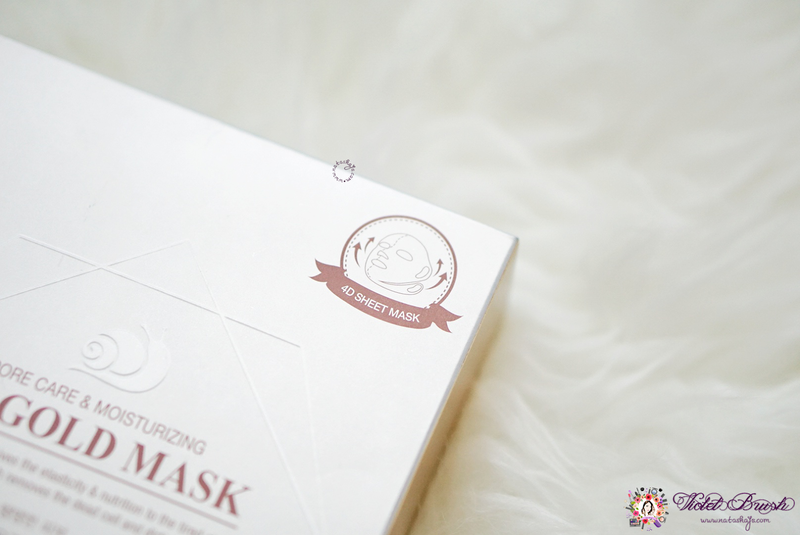 Violet Brush • Indonesian Beauty Blogger: 4D Mask? With Gold Particles? 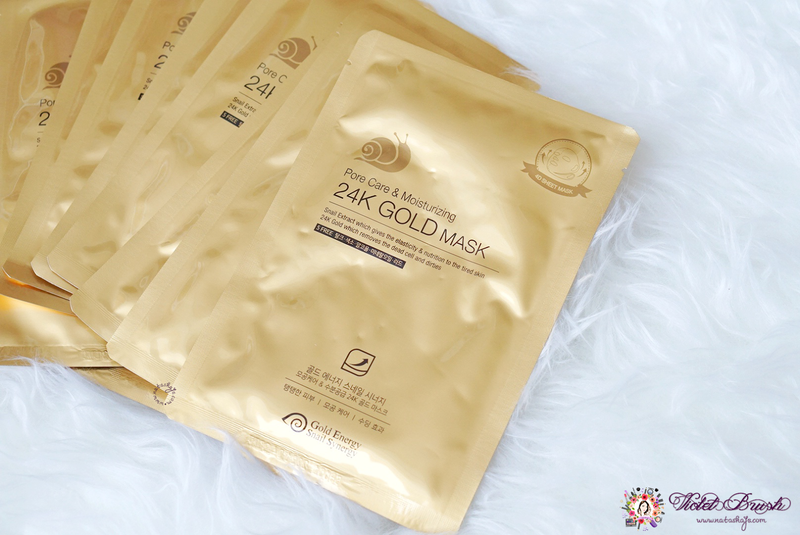 Meet Gold Energy Snail Synergy's 24K Gold Mask! Snail extracts gives elasticity and nutrition to the tired skin while 24K gold removes dead skin cells and dirt. 3. Relax tense and supposedly aged areas like forehead, between and around the eyes, and smile lines. 4. Massage in upwards direction, starting from the middle of the jaw to both ears to lift and tighten the jawline. 5. 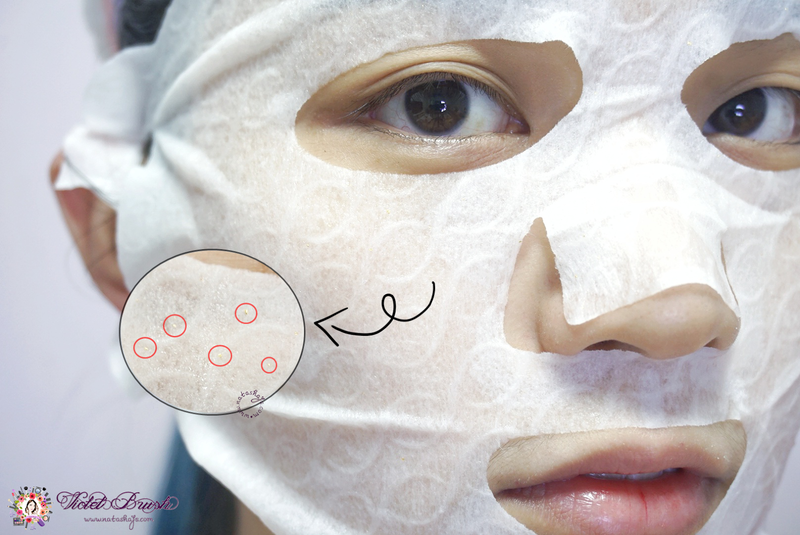 Remove the mask sheet after 15~20 minutes and tap your entire face slightly to let the essence absorb. 6. Use 2~3 times a week for best result. During summer, keep in the refrigerator for cooling sensation. 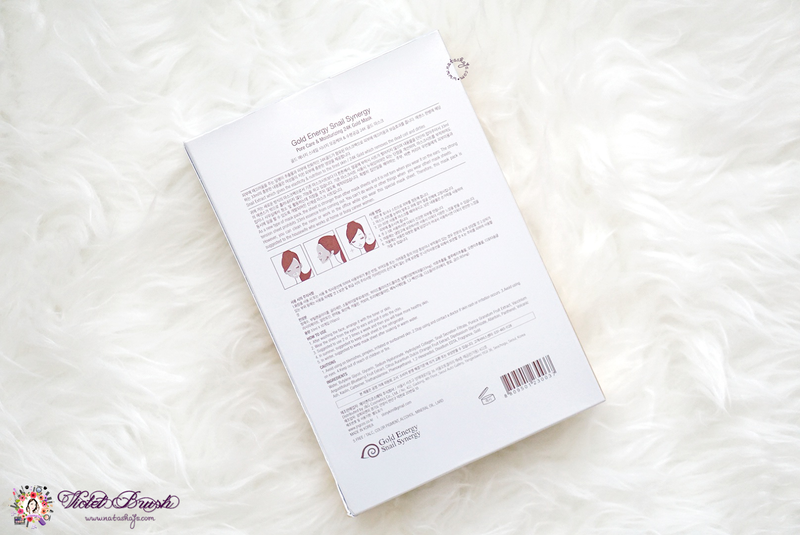 During winter, use mask sheet after soaking it in warm water. 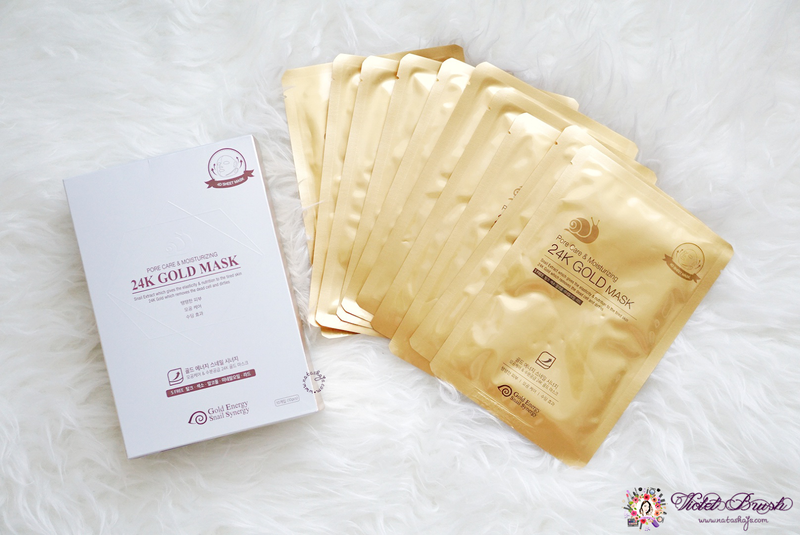 The packaging of Gold Energy Snail Synergy's 24K Gold Mask is nothing much different with other sheet masks. It's packed individually in a gold-colored 'pouch' and sold in a bundle of 10 sheets packed in a white-colored box. As mentioned above, it's a 4D mask sheet. Gold Energy Snail Synergy's 24K Gold Mask has double ear loops, two on the cheek sides, and two from the jaw sides. It's said to be made from strong tencel fabric and I can vouch for that. My face is pretty wide compare to Koreans so I thought I wouldn't be able to pull both ear loops from the cheek sides to fit my face, because from my experience, it would just be on the verge of tearing or be teared. But when I pulled the ear loops, it stayed strong even though it felt a little bit tight. My camera couldn't quite capture the gold particle on the mask but if you zoom in the photo, you can see the bits of the gold particles which I marked with the red circles. These gold particles gives a slight scrubbing effect on the skin. After first use of Gold Energy Snail Synergy's 24K Gold Mask, my skin felt refreshed and more supple. I love how it contains just enough amount of essence and how the essence has watery texture which makes it absorb pretty fast. However, it's not as moisturizing, perhaps due to the watery essence. During the past two weeks, I've been using this regularly with 2~3 days interval. I haven't seen any significant improvement on my skin but it's a perfect mask to use on hectic days. Due to its refreshing effect, I somehow felt like this mask made my tiredness ebb away and made me relax. I want to try their other variant which is the Face Nutrition!